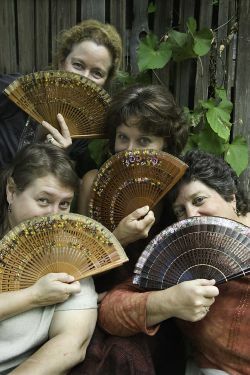 The Righteous Mothers are four funny, philosophical female folk-rock musicians who have been one of the Northwest’s foremost musical performing groups for the past 31 years. They whip their audience into a frenzy with zany original music, witty theatrics, and mind-boggling, intricate vocal harmonies. The Righteous Mothers grab hearts and funny bones with songs about ice cream, labor pains, annoying dreams and Supreme Court decisions. They surprise and delight young and old, gay and straight, male and female with their quirky humor and open hearts. The Righteous Mothers lead full lives as professors, teachers, a children’s book author and a Tribal Court Judge.